The Mergui archipelago in Myanmar (Burma), which comprises of over 800 Islands and covering 10,000 square miles was closed to foreigners for many years. 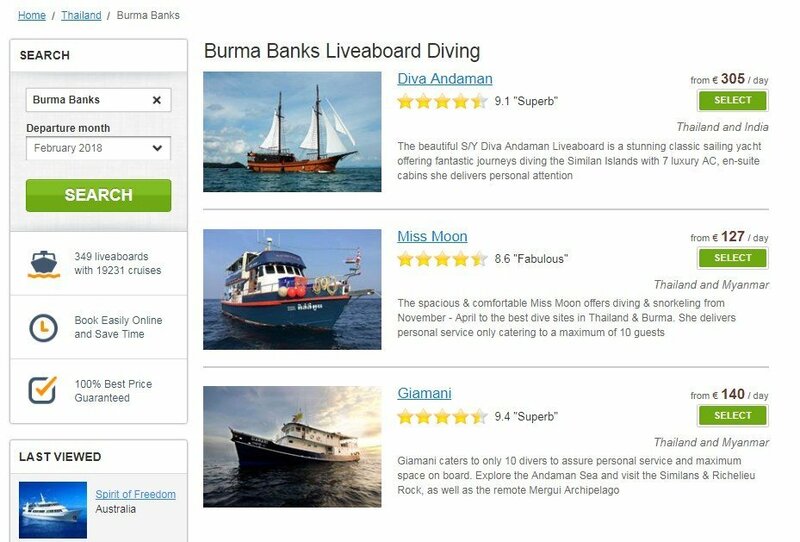 Only since 1997 that Burma welcomed liveaboard dive boats for scuba diving. 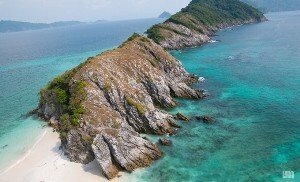 Beautiful islands with white sandy beaches, interesting dive sites, wonderful coral gardens and a huge variety of marine life are all that Mergui archipelago has to offer. With remote destinations and deep water, divers visiting Myanmar are expected to be experienced. Before visiting make sure you are comfortable diving in strong currents, and at deeper depths. You should bring your SMB and a reef hook, and ensure that you are proficient using both. With Myanmar being so remote ensure you have adequate spares of all vital equipment so you don’t miss out on any dives due to equipment failure. With repetitive deep dives on most liveaboard it is also best that you are Nitrox certified and try to use it as much as possible. Join our Liveaboard and you will have a chance to explore one of Southeast Asia’s last unexplored archipelagos. Burma Liveaboards usually can accommodate up to 22 guests in spacious air conditioned cabins with sea-view windows. There are different types of cabin available on each boat. Burma liveaboards also provides spacious dive and sun deck, huge saloon with flat-screen TV and DVD player, 3 spacious toilets with showers and 2 showers on the dive deck. All meals on board are freshly cooked and served Buffet Style. Snacks and fruits are served in between dives. The main diving in Myanmar happens in the Andaman Sea, so the marine life can be very similar to Thailand’s west coast. The corals are rich and colourful with a wide variety of species both hard and soft. Depending on the time of your visit you can encounter whale sharks and manta rays. For fans of the more macro side of things, you can find frogfish, ghost pipefish and ribbon eels. 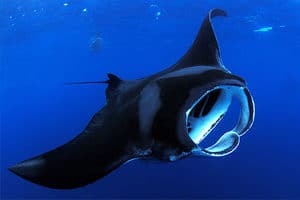 On the other hand, if you are a fan of the bigger stuff, you can encounter bull sharks, grey reef sharks, devil rays, and mobula rays to name but a few. One thing to remember is that with over 800 islands, there is still plenty of exploration to be done in Myanmar and more and more interesting locations are being found. The jewel in the crown of diving in Myanmar is the Mergui Archipelago. Here you will find some of the best and most diverse dive sites in Burma. In addition, there is also some great diving in the Burma Banks, which offer a host of unique features. The most popular dive site in Myanmar, this stunning islet offers sheer walls and a rich coral environment. The site is host to a large number of critters and reef fish, while in the blue the reef is patrolled by huge barracudas. The southernmost dive site of the Mergui Archipelago, it provides a very rich marine life, and includes some interesting geographical features, including a stunning channel that runs through the heart of the island. This site is arguably the best wall diving in Myanmar. Described by some as a bustling shark metropolis, here you will find large numbers of grey reef sharks and nurse sharks. This is one of the best dive sites to sit back and enjoy some shark action. The banks are home to what appears to be small flat-topped mountains in the sea. Once you drop in on these tables, you find you are on top of a mountain that descends several hundred meters. Diving here is not for the inexperienced with strong currents, and sharks almost guaranteed. Most of the dives are deeper than 20m/66ft, and aside from the marine life you will encounter some of the most beautiful and pristine sea fans and hard corals any diver has seen. The main liveaboard diving season in Myanmar runs from October to May, and sea temperature will range from 26C/79F to 30C/86F. The best time to dive the Mergui Archipelago is between December and April, when conditions are optimal and visibility is at its most impressive. If your heart is set on whale sharks, then the best time to visit is from February to May when most encounters occur. The climate in Myanmar is tropical with three seasons. The rainy season or low season lasts from May to September; the rain can be very heavy and cause roads in remote areas of the country to become impassable and villages and towns do get cut off. The peak of the rain lasts from July to September. It is notable that during the rainy season the area between Mandalay and Pyay gets the least rain and can remain relatively dry. The shoulder season runs from October to November, and March to April, when the rain becomes very intermittent and the temperature is hot and humid. Yangon can often reach 40C/104F and the combination of h can make the heat quite oppressive. The dry or high season follows from December to February, when the temperature drops and all the rain stops. Diving in burma is a wild experience, no boats around, peaceful diving. Nice diving around the Burma banks, Myanmar diving is great, black rock was amazing we spot a couple of manta rays. The islands are beautiful with no tourism yet! In recent years the name Burma or Myanmar as the locals call it has been more associated with political turmoil than any other touristic activity. In fact, the country was pretty much closed to the outside world up to 1997, when it first started to take small steps to open up to tourists. Over the last few years as the political situation has stabilized and improved more and more tourists have visited, although the country still seems untouched by the influence of western culture and mass tourism. Tourists who visit Myanmar today must feel like the first people who started visiting some other Southeast Asian touristic destinations twenty or thirty years ago. Even though it was relatively isolated and subject to sanctions for a long time Myanmar still has plenty to offer and has a rich and diverse history and culture. Aside from exploring pristine dive sites there are plenty of breath-taking experiences to be had in Myanmar. Myanmar’s capital city is Naypyidaw, which is not that well known internationally. Rather, its largest and best-known city is Yangon (Rangoon), which is also home to the Yangon International Airport RGN, the busiest and main gateway to Myanmar. Depending on where you are flying from you do have the option of accessing Myanmar via Mandalay international airport MDL, and Naypyidaw international airport NYT. The national carrier of Myanmar is Myanmar National Airlines. The airline is state-owned and operates flights across the country, as well as to Thailand, Singapore, and Hongkong. The airline’s main hub is located at Yangon international airport, from which it serves 31 destinations both domestic and international. Electricity in Burma is 230 volts AC at 50 hertz cycles. Across the country you will find a different array of plugs and sockets, so it is best to bring a multi adapter that can accommodate several types. Be aware that power across the country is not too reliable, and blackouts and power surges are a regular occurrence. These tend to be more frequent and longer during the rainy season. The currency in Myanmar is the Myanmar Kyat (MMK). The exchange rate against the dollar is 1USD to 1,333 MMK, or 1 EUR to 1,655 MMK. While you find ATMs at some of the major cities they are not widespread across the country, and neither are credit cards that widely accepted, particularly in the more remote regions. When travelling in Myanmar it is always best to have some dollar bills preferably in lower denominations in case you cannot find an ATM. To be able to exchange your dollars smoothly make sure that the bills are issued after 2006, and that they are in pristine crisp condition; exchanging bills that are worn and less than immaculate could prove quite difficult if not impossible. In the main cities of Yangon and Mandalay it is also possible to exchange other currencies especially Euros and Thai baht. Myanmar has a population of 51 million people, by far the largest ethnic group is the Bamar who comprises 68% of the population. The rest of the population is divided amongst the following ethnic groups: Shan 9%, Karen 7%, Rakhine 4%, Mon 2%, and the remaining 10% is divided amongst a host of other ethnicities. Burmese is the main language in Burma and the country’s only official language, it is also the mother tongue of the Bamar people. There are plenty of other regional languages including Kachin, Kayah, Karen, Chin, Mon, Rakhine, and Shan, but most people will speak Burmese as well as their own regional language. In the more remote regions of Burma English is not widely spoken, although in towns and cities that are more open to tourism there are plenty of people who speak English. It is estimated that at least 5% of the population in Myanmar speaks English. Myanmar is a socially conservative country with a majority Buddhist population. 87.9% of the population follows Theravada Buddhism, while the rest are split between Christian 6.2%, Muslim 4.3%, and the remaining 1.6% holding a variety of other beliefs. Health facilities in Myanmar are very poor, and the country has the lowest percentage of GDP expenditure on health than any other country in the world. Outside of Yangon or Mandalay health facilities are very limited. Even when health facilities are available they are expensive with a visit to a local doctor in a western-style health facility costing $50 or more. Ensure that you have travel insurance that will cover your trip and will arrange your evacuation to your home country or a better equipped medical facility in a nearby country. One thing to remember is that malaria is rife in Burma, especially outside the main cities, so precautions need to be taken. Be advised that depending on your overall level of health you may need vaccinations or other prophylactic measure before travelling. The CDC (Centre for Disease Control) advises that travellers are vaccinated against Hepatitis A and Typhoid, especially if you are visiting rural areas. Diving insurance is essential when visiting Myanmar. There are no decompression chambers in the country, and in the event of an accident you will need to be evacuated to Thailand where the nearest chambers are located. The cost of the evacuation by specialist aircraft can easily run into the 1000’s of dollars, so it is best to be prepared. There are no diving physicians in Burma or specialist diving facilities so it is best to have supplementary diving insurance that will cover you in case of an accident. Getting around the country can be a little daunting. 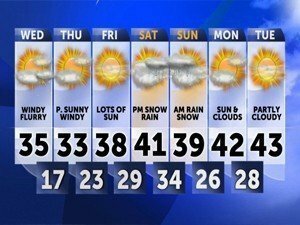 The roads are not in the best of shape and driving can be a little risky. While it is possible to take buses or taxis, it is easier to use other means especially if you are taking a long journey in the country. Trains can make for an interesting journey in Myanmar and are a good way to see areas of the country untouched by tourism. In addition to the charm of the journey travel by train can be a very cost-effective way to explore the country. One of the easiest and most popular ways to get around quickly is to travel by plane, and there are numerous airlines serving the domestic market. While most airlines offer a decent quality of service and have a reasonable safety record, some do not. Sadly, the situation is always in flux, so it is best to check the latest updates about the safety of the various airlines operating in Myanmar. Burma has a rich history and culture; when not diving there are plenty of things to occupy yourself. There is a large number of beautiful temples including the Shwedagon Pagoda, the Bagan temples, and the Gubyaukgyi Temple. After visiting a temple, you can always relax on Ngapali Beach, which with pristine white sands and palm trees is one of the most stunning in Myanmar. The list of historical and cultural tours in Myanmar is almost endless; however, if you fancy something different there are also plenty of organised tours where you can explore the many lakes and natural wonders of the country including the Floating Gardens, the Maymyo Botanical Gardens, and Inle Lake. If you like exploring and heading off the beaten track to explore new destinations, then Myanmar should be your next destination. When it comes to diving it is one of the few locations around the world that represent the final frontier. The Mergui Archipelago alone has more than 800 islands and there are still plenty to be discovered. Heading to Burma now will give you the best chance to experience something unique before it is altered forever by an influx of mass tourism.